Now that fall is here and winter is almost upon us, it’s time to bust out the mugs for all those warm drinks! 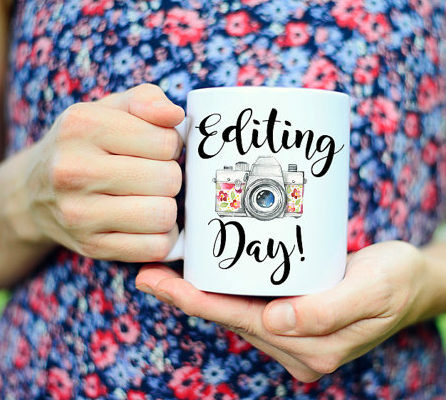 If you have been looking for the perfect gift for the photographer in your life, consider a cute mug! 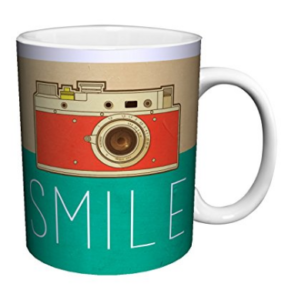 I have searched out camera-themed mugs that any photographer would love to add to their collection. From mom-photographers to women who are rocking their own photography business, here are 16 options that are sure to hit the spot for a photographer in your life. Some of these will be making an appearance in my cupboard soon! 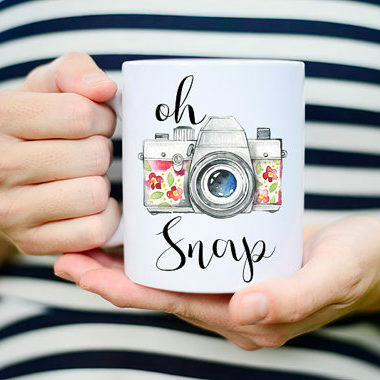 The camera on this mug is absolutely adorable! The floral print and brush lettering make this a sweet choice. 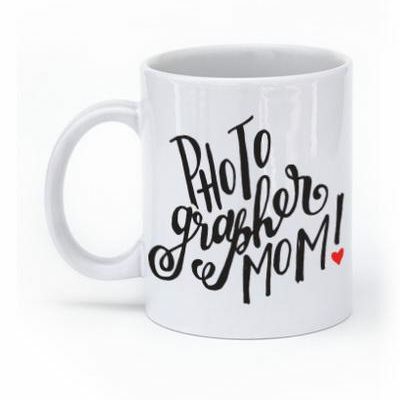 This the cutest mug for moms who like to take photographs! Whether you take pictures of your own family or run a side business, this is a tribute to moms everywhere! Yes, you are “seeing this correctly,” sorry I had too! This clever graphic is a play on the eye chart at the optometrist. Have a long day to edit family photos from a trip? This cute mug will make it more enjoyable! 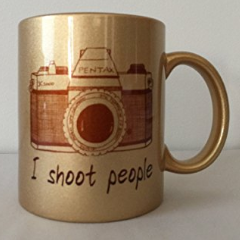 This mug will amuse any photographer who has found themselves in an awkward situation when they refer to “shooting” people …with a camera! If you liked the mug above but wanted a little more pizzaz, this one with a touch of gold is always a winner! A lot of people love this quote. 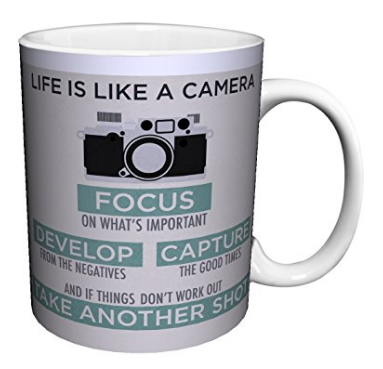 “Life is like a camera: focus on what’s important, develop from the negative, capture the good times, and if things don’t work out, take another shot!” Get it on a cute mug! 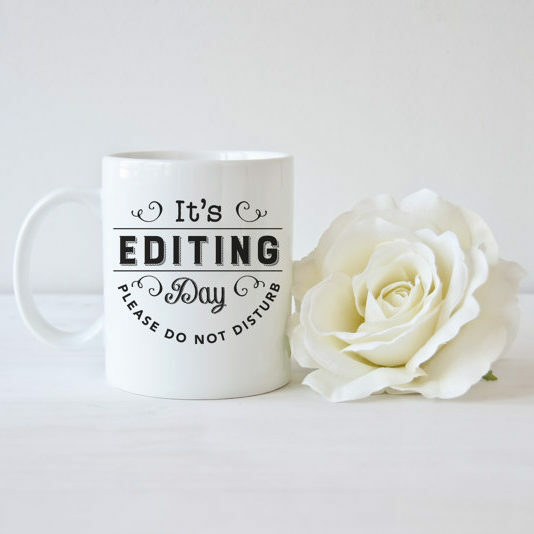 This is the perfect gift for anyone who has lots of editing to do – photographer or mom! 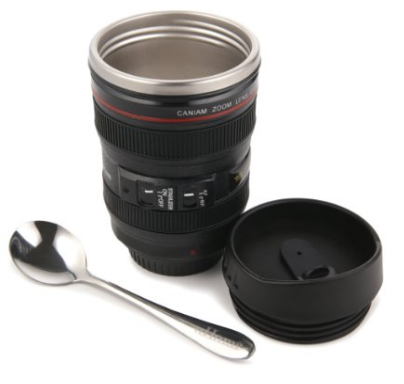 This clever mug looks exactly like a Canon lens – it’s super fun for photographers who already love their lenses! 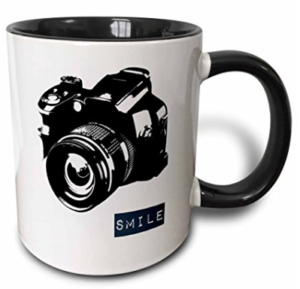 Here’s the Nikon version of the above mug. The lens cap clicks on and off and it has a metal interior. 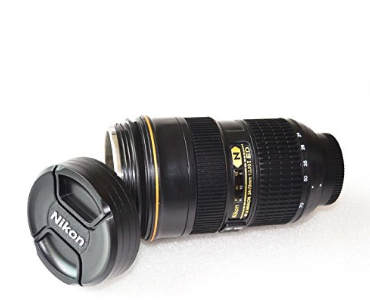 I like this one because it comes in a familiar looking Nikon box with it’s own lens bag. Just don’t mistake it for your real lens! 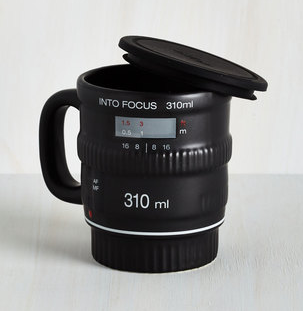 This one isn’t as realistic, but it’s still super cute option for someone who wants a lens mug but likes a handle. I love that it has a lens cap too! 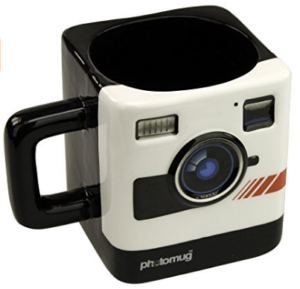 This unique mug is a nod to the retro cameras of old. It’s square and has plenty of vintage character! This one is called “Instant Love” which was a fun play on words too. 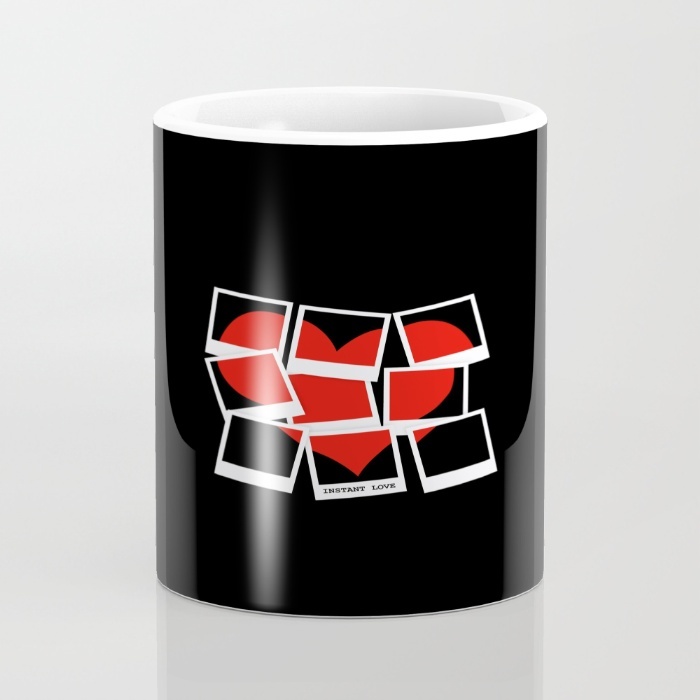 I love the Polaroid look with the heart too! Love the fun colors on this one – it’s my favorite shade of turquoise blue. Great for casual photographers. 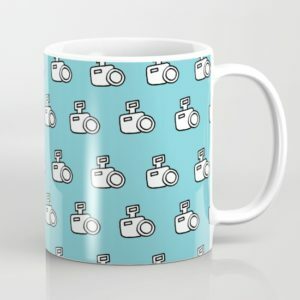 Society 6 has TONS of other photography themed mugs, I couldn’t put them all on here without overloading you – but I liked this multicolored one and this cat one too! The two-toned design on the cup makes this one unique. 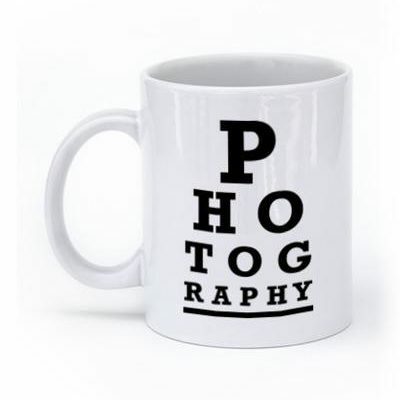 It might be just the right photographer gift! I’m loving the unique colors of this mug- it’s a fun break from the usual black and white. I hope one of these mugs is exactly what you were looking for – they certainly make me want to curl up with a warm cup of cocoa! 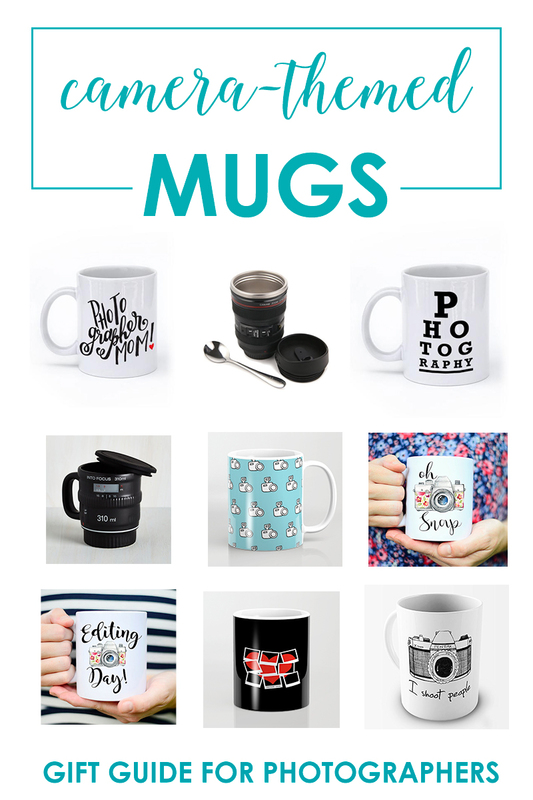 Even if mugs aren’t your thing, check out our other photography gift guides. I’m sure you will find something you love!